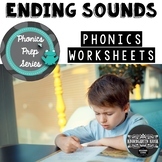 10 Ending Sounds Worksheets. 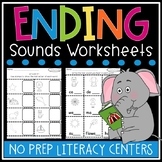 Preschool and Kindergarten Literacy Worksheets. 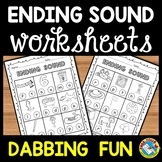 KINDERGARTEN PHONICS WORKSHEETS PACK (DABBING FUN) DAB THE ANSWERSThis print and go mini pack (focusing on the ending/ final sound in a word) is lots of fun for children and contains 5 simple worksheets. 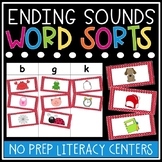 Students look at each picture and choose the letter that represents the final sound in a word. 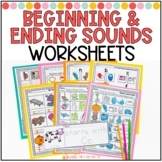 This pack contains worksheets to scaffold development of initial sounds, ending sounds and hard to learn sounds (z & x). It also includes a 'Word Detective Pyramid' that you can blow up to A3 and use in guided or shared sound work. 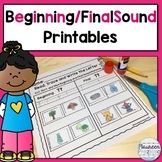 This unit provides you with 10 worksheets. The children will say the name of the picture and draw a line to the matching ending sound. 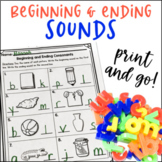 This simple black and white worksheet is designed to help students listen and write ending sounds in words. There are three level worksheets intended for differentiated instruction. One worksheet would be best for higher level students, mid level students and lower level students. 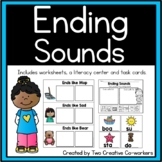 This is a pack of five ending sounds worksheets. 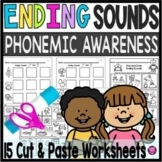 Each worksheet has fantastic clip art that your students will be drawn to, and a place to write the ending sound of each picture.